Supple Communication Ltd has secured a Media Partner for the new Eko International Film Festival, the Filmfestivals Entertainment Group in Europe. 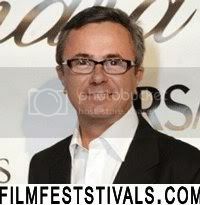 Mr. Hope Obioma Opara, the President of Eko International Film Festival will be meeting with Bruno Chatelin, COO, Filmfestivals Entertainment Group in Paris before the end of the week to discusss the details of the partnership. Kulturati is a celebration of Arts and Culture. This intellectual section on Arts and Culture is edited by Mr. Funso Orimoloye, the Foreign Bureau Chief of Supple magazine in Chicago. The Publisher of Supple magazine and other Nigerian journalists from, The Guardian, The Punch, This Day were among the thousands of accredited journalists, filmmakers, movie stars, film aficionados and others from all over the world who were at the 62nd Festival de Cannes. Nigerian filmmakers Faruk Lasaki, the director of Changing Faces, the most successful Nigerian movie so far, Fidelis Duker and his amiable wife Temitope were also there. The delegation of the Nigerian Film Corporation (NFC) had nothing to show that Nigeria was indeed the second largest movie industry in the world according to the UNESCO. Visitors did not even get a catalogue of Nigerian movies at the Nigerian pavilion and no Nigerian movie qualified for screening or the competition. Going to Cannes is not a big deal, but competing for the highest honours is the real deal. Nollywood buffs boast that it is the second largest “film” industry in the world, but unfortunately none of the Nollywood movies has even qualified for official screening and the competition at the Cannes Film Festival. The last Nigerian delegation to Cannes turned it into a jamboree and became the laughing stock of the Cannes Film Festival for their extravagant party. Were they celebrating their failure to qualify for screening and competition? We have addressed the celebration of Nigerian mediocrity in the emphasis on quality than quality in Nollywood. Nigerians love celebrating mediocrity and as shown in their disorganized music industry and film industry, most Nigerians careless about professionalism in entertainment. “Yeelen” (“Brightness”), by the Malian director Souleymane Cisse was the first African film to win a major prize at Cannes when it won the coveted Prix du Jury at the Cannes Film Festival in 1987. Many African films have been screened at the Cannes and among them were “Les Yeux Secs” by Narjiss Nejjar from Morocco, “Le Silence de la forêt” by Didier Ouenangare and Bassek ba Kobhio from the Central African Republic and Cameroon in 2003, “Khorma” by Jilani Saadi from Tunisia in 2003, “Heremakono” by Abdherrahmane Sissako from Mauritania in 2002, “La Saison des Hommes” by Moufida Tlatli from Tunisia in 2000, “La Genèse” by Cheick Oumar Sissoko from Mali in 1999, “Kini et Adams” by Idrissa Ouedraogo from Burkina Faso, “Le Destin” by Youssef Chahine from Egypt in 1997 and “Po di Sangui” by Flora Gomes from Guinea Bissau in 1996. The Nigerian film industry is 104 years old and the first Nigerian film “Palaver” was shot in 1904. The most accomplished Nigerian filmmakers like Ola Balogun and the late Hubert Ogunde have produced notable films in the 1970s and 1980s and what is now dubbed as Nollywood is the result of the collapse of the Nigerian film industry in the late 1980s. Nigeria should be competing for the top prizes at Cannes and not calling the mere acceptance of screening a Nigerian film a feat! Ekenyerengozi Michael Chima is the Media Consultant of Supple magazine and a notable writer on Nollywood and the author of four books. Supple magazine previews and reviews top movies before and after they hit the box office. We show you the movies with other reports on the latest movies and movie stars from Hollywood to other parts of the world. Enjoy. Michael Okon, the handsome Nollywood star actor is the first Nigerian celebrity to be on the cover of Supple magazine. The interview on Michael Okon is a must read for all his fans and those who want to know how they have made the thousands of movies making Nigeria the second movie industry in the world. The second edition has other interesting features on entertainment and relationships. 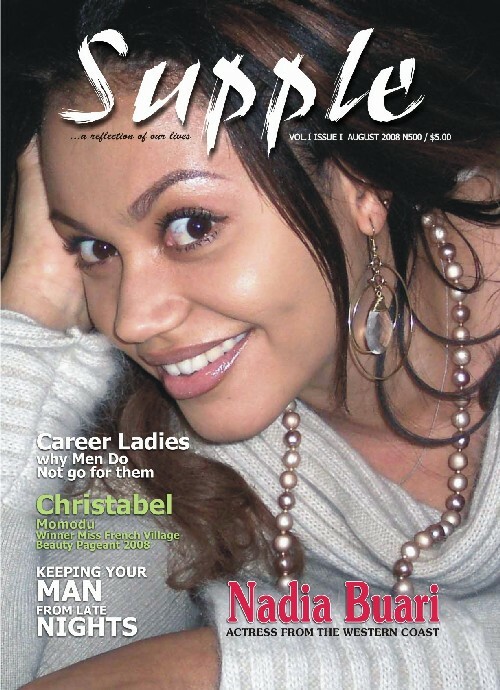 Pretty Ghanaian actress Nadia Buari is the first celebrity to be on the cover of Supple magazine with an indepth interview by the American based Nigerian publisher and prize-winning writer Sola Osofisan. This is a must read for all fans of Nadia and lovers of African movies. The maiden edition also has interesting features on why man Nigerian men are afraid of career ladies, how to keep your man from infidelity, the beauty of mothers and their daughters, interviews with black beauty queen Christabel Momodu, the 2008 Miss French Village in Nigeria, Nollywood star actor Emeka Enyiocha, top Nigerian fashion designer Frank Oshodi, news from the Hollywood Insider, Veronique Pierre, the Kulturatti column of the Chicago based foreign bureau chief, the phenomenon of the Internet whiz kid and Facebook CEO Mark Zuckerberg and so much more.